Oil on canvas, 55 x 81,5 cm. In this painting, J.A. 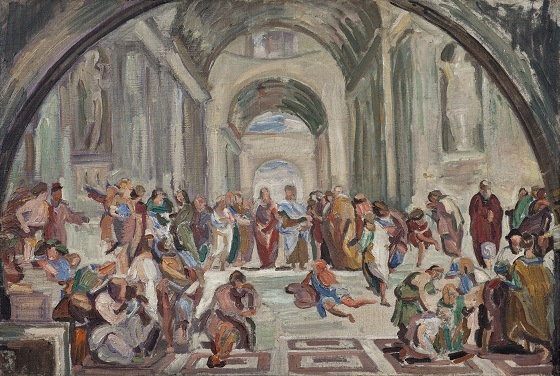 Jerichau has sought to capture the essence of Rafael’s The school of Athens through a Modernist lens using limited, broad brush strokes. He completed the painting while he was still a student at the Danish Royal Academy of Art. The young artist’s initial interest in Rafael’s works was sparked by the learned art historian and professor Vilhelm Wanscher, who taught at the academy. Wanscher’s lectures on the so-called Grand Manner style of the Renaissance and Baroque made Jerichau develop an interest in Renaissance painting traditions, which he eventually incorporated into his own art. However, inspired by prominent figures such as Vincent van Gogh, Paul Cezanne and Edvard Munch, Jerichau’s application of the Grand Manner resulted in more modern and expressive imagery.